Spending time outdoors is something we all wish we could do more of. With such a unique layout to this Westlake Hills outdoor living space, these homeowners can live the outdoor lifestyle to its fullest potential. Combining a backyard kitchen next to a cozy outdoor living space opens up a plethora of options on how to use their outdoor oasis every night. From hosting a girl’s night dinner party to spending a relaxing evening in the hot tub watching the game, this multiple outdoor living space becomes the main hub of the home. Nestled at the bottom of Texas’ hill country in Westlake Hills, this covered porch/patio was designed around an existing fireplace giving the impression that you are far from the city. When in retrospect it’s only a quick fifteen-minute drive to the downtown Austin area, giving the best of both worlds. 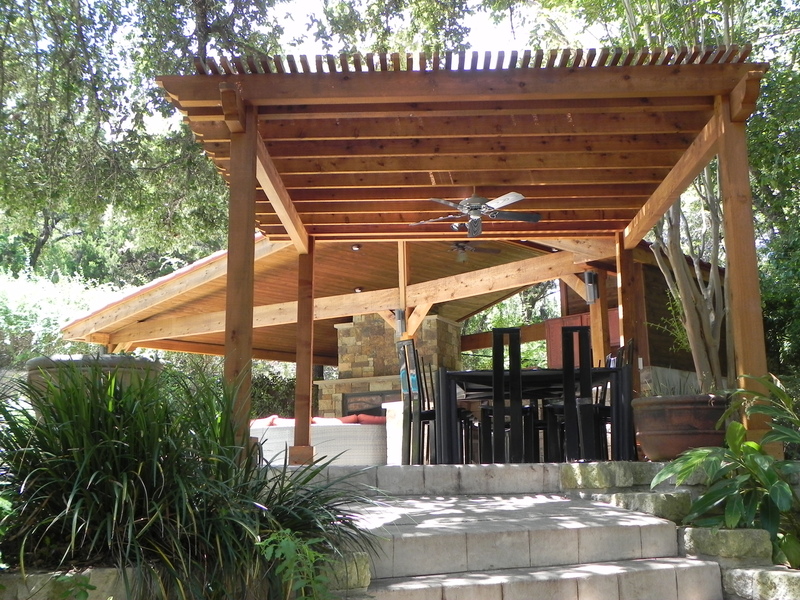 When designing this Westlake Hills covered porch the outdoor living lifestyle of the client was incorporated for easy access from the pool to the 10-person dining area. Whether planning to have a large pool party or dinner poolside with the kids, easy access ensures that having a spot to dry off and wind down after a swim is never an issue. This spacious covered patio integrates multiple living spaces allowing the homeowners to enjoy the outdoors to its fullest potential. The fully equipped outdoor kitchen ensures no one misses out on the fun. The cupboards provide storage space for outdoor kitchen ware while the sink and refrigerator complete the kitchen’s purpose for never having to step foot back inside. Posing as a second living room, the outdoor furniture was perfectly placed by the homeowners between the pool and fire helping them escape to their happy place. The space harmonizes to ensure that enjoying a glass of wine with your feet up next to the warm fire while also being able to keep an eye on the kids in the pool provides the perfect setting for a relaxing Friday night. No matter the day of the week this outdoor oasis in the hills will help you escape after a long day. 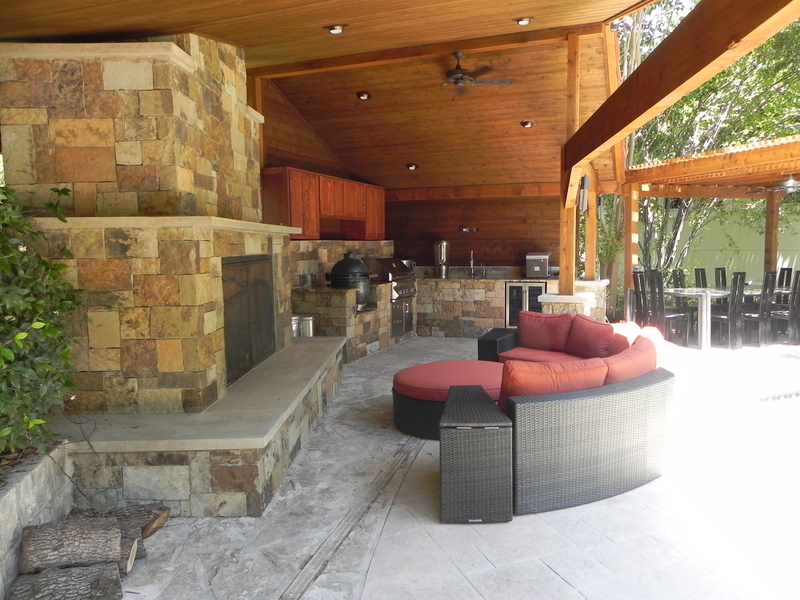 Contact Archadeck of Austin at (515) 259-8282 or via email at jim.odom@archadeck.net to schedule a free design consultation for your outdoor hideaway. This entry was posted on July 19, 2016 by austinporchandpatio. 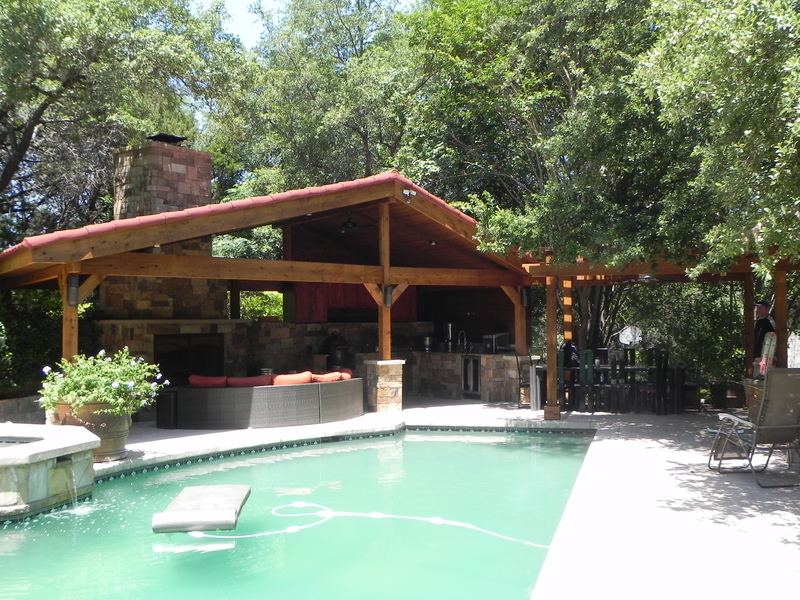 It was filed under Archadeck of Austin, Austin outdoor kitchen, Austin patio cover, Covered patio Austin, Covered porches, Detached patio covers, Freestanding covered patios, Pool-side Cabanas and was tagged with Archadeck of Austin, Archadeck of Austin design, Austin covered patio, Austin covered porches, Austin outdoor fire place, Austin outdoor room, Austin patio covers, Unique patio designs Austin TX, West Austin TX covered patios, Westlake Hills TX covered patio builder, Westlake Hills TX poolside covered patio builder.